Nespresso’s new coffee capsule coffee machine keeps things simple. The Lattissima One is compact, easy to use, and will look beautiful in any kitchen. Here’s our Nespresso Lattissima One review. Click here to buy the Nespresso Lattissima One for £219 from Nespresso.com. Nespresso Lattissima One review: Should I buy? The Nespresso Lattissima One is a great coffee machine for someone who wants to enjoy Nespresso-quality coffee with minimal effort. 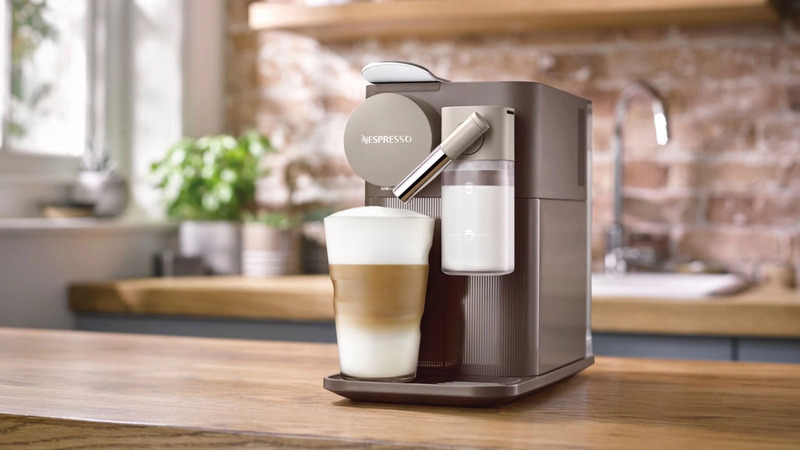 There are cheaper (Nespresso Prodigio) and better (Nespresso Expert Coffee & Milk Machine by Krups) Nespresso coffee machines out there – the Lattissima One sits nicely in the middle of these. Making it a unique and excellent coffee machine all-rounder. What you’re getting with this is ease-of-use and a modern design. If that’s what you’re looking for, then great. If you’re not quite sure, we suggest taking a look at our best capsule coffee machine article and have a look at what else is on the market. If you’re not sure what type of coffee machine you want (capsule, bean-to-cup, or filter) take a look at our roundup of the Best Coffee Machines 2018, here we take you through what each machine does and rank our pick of the year’s best coffee machines. There isn’t an easier coffee machine to operate on the market. The Nespresso Lattissima One is a capsule coffee machine that comes with just three buttons. Insert your capsule and press one button for an espresso, another for lungo and third for either a latte or a cappuccino. The third button works out whether you want a cappuccino or latte type of milk-based coffee you get depends on how much milk you put in the jug. The milk jug is another area that Nespresso has evidently worked on. It’s been designed to use all the milk in the jug (so no wastage). The jug has two markers to let you know how much milk to put in for a latte and how much milk to put in for a cappuccino. Fill the jug to the cappuccino line (about half way) and the Lattissima One will automatically dispense foamed milk into your mug. Fill it to the latte marker and the machine will first pour hot milk into your jug, followed by foamed milk – giving you a traditional espresso latte. Coffee machines that feature built-in milk jugs can often cause more hassle than their worth as milk goes off quickly. The Lattimssa One combats this by making its milk section (comes in five parts – all dishwasher safe. The other trump card it has is that it uses all of the milk in the jug… so there’s less milk to turn in the first place. See also: Best Coffee Machine 2018. Coffee Machines, including ones bearing the Nespresso badge, can sometimes look plasticy and clumsily put together. Not so with the Lattissima One. It boasts bold shapes and angles that compliment its plastic and metal design. The water and milk jug sit flush against the machine’s body while both the coffee and milk spout both manage to look stylish. The downside to the compact design is that the machine doesn’t have the biggest water tank. At 1 litre, it’s on the small side for the industry. It’s milk jug, 0.12 litre, is equally tiny – but, as we mentioned above, this is deliberate to prevent wasted milk. The Machine is only available in two colours. Mocha Brown or Silky White. The Nespresso Lattissima One is a gorgeous and slim capsule coffee machine that couldn’t be easier to use. It’s just as easy to maintain too. If you want to make a quick Nespresso coffee at the press of a button, there isn’t a coffee machine that rivals this for convenience. Users will love the new “no waste” milk jug too. For convenience’s sake alone, there is no better coffee machine than this.